Do you or your partner snore so loudly and frequently that it’s affecting not only your quality of sleep, but your quality of life during the day, and even your relationship with your partner or family? Chronic snoring may seem like a fairly trivial problem for some, but for others, it’s a sign of a serious and potentially deadly disease called sleep apnea. Thankfully, we have a non-invasive, affordable treatment option for you at We Smile Dentistry – that may eliminate the need for a CPAP! 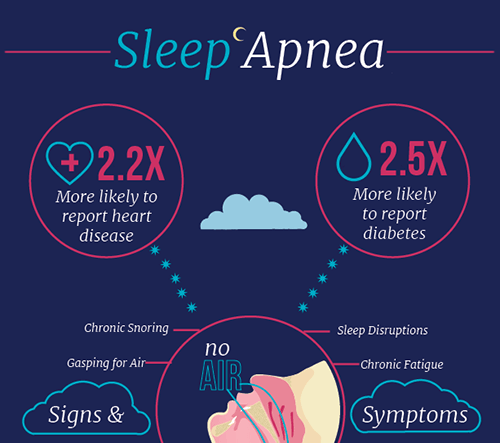 Obstructive sleep apnea (OSA) is a common sleep disorder that can decrease your quality of life and increase your risk of developing other serious health problems. Obstructive sleep apnea occurs when the soft tissues in the back of the throat collapse during sleep, blocking the airway and preventing the sufferer from breathing properly throughout the night. Sleep apnea can often be difficult to diagnose because symptoms are largely present during sleep. It often requires a partner or family member to realize there is a problem. There are certain demographics and lifestyle factors that increase your risk of developing sleep apnea. When the only time the body can truly heal and repair itself is during sleep, it’s no wonder sleep apnea sufferers will see a decline in their overall health. Their immune system will weaken, and blood oxygen levels are lowered, which can increase the risk for many serious systemic diseases. A sleep study is required in order to diagnose sleep apnea. Traditionally, the gold standard for sleep apnea treatment is a CPAP machine. Maybe you’ve tried treatment with a CPAP machine, but found the machine and face mask uncomfortable and prevents restful sleep – kind of defeats the purpose, right? Thankfully, your London dentist has a convenient, non-invasive, affordable alternative. Many patients have been able to successfully treat their sleep apnea with oral appliance therapy. Oral appliance therapy is a revolution in the field of sleep medicine. A simple oral appliance, similar to a mouthguard, is worn during sleep. Oral appliance therapy gently shifts the lower jaw forward, effectively preventing the airway from collapsing, allowing you to breathe comfortably throughout the night. This device is custom-made to fit your mouth and your individual needs. Oral appliance therapy is safe, convenient, and highly effective in treating patients with sleep apnea. No more uncomfortable face mask hooked up to an oxygen machine. No more needing an electrical outlet to sleep. No more traveling with a bulky CPAP machine. Oral appliance therapy offers patients freedom from sleep apnea and freedom from CPAP machines. Dr. Spagnuolo and our team at We Smile Dentistry would love to help you improve your quality of sleep, your quality of life during the day, and ensure a healthier, more energized tomorrow. Sleep apnea treatment can ease tensions for partners and families suffering the consequences as well. A snoreguard is an oral device, similar to those used for oral appliance therapy—but snoreguards are generally not considered medical devices, and do not require a prescription. Snoreguards are not typically approved to treat sleep apnea, but can offer definitive relief for patients who chronically snore, and may relieve some sleep apnea symptoms. So what’s the best option for you? If you have any questions about sleep apnea or would like to schedule a visit, please give us a call at (519) 661-0042 or get in touch with us online. Your London sleep dentist, Dr. Giulio Spagnuolo and our team at We Smile Dentistry look forward to smiling with you! Serving smiles from London, St. Thomas, Lucan, Dorchester, Strathroy, and beyond!